Born in New Caledonia Severine Hannam spent most of her childhood on boats and from an early age developed a keen interest in marine life. She graduated with a Master in Marine Biology from AUT University in 2008. Her Masters research looked at benthic invertebrate diversity and density in Tucetona laticostata (Dog cockle) beds and involved countless hours sorting sediments and identifying invertebrates. Severine also worked as marine biologist Dr Steve O’Shea’s research assistant from 2008 to 2011, spending most of her time in the field collecting samples or processing them in the university’s laboratories. 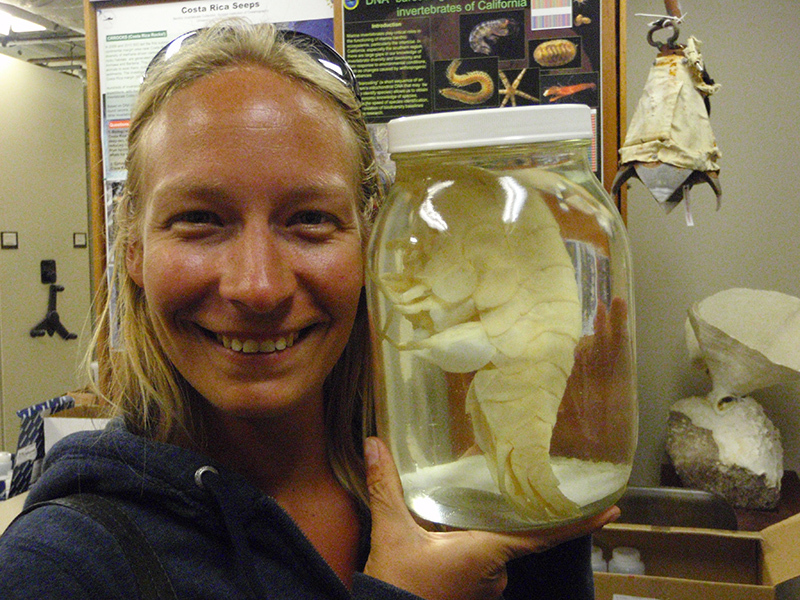 Her role also saw her looking after the university’s marine invertebrate collection. Qualified as a scientific diver, Severine has spent time on vessels of all sizes gaining significant dive experience and knowledge of scientific field gear. She is currently natural sciences collection manager at the Auckland Museum, looking after the marine and geology collections. In her spare time … she does more of what she loves, spending her time diving and learning more about her favourite marine animals – crustaceans, a group of invertebrates which includes lobster, shrimps and many more. From above the water the Three Kings look like many other groups of rocky islands but this expedition is an opportunity to find and bring back some of their unique and rare underwater fauna and flora. I hope to assist in collecting and preserving new specimens for the museum collection. Being a scientific diver, I will spend a lot of time diving to collect fish and invertebrate. I will also focus on fixing and preserving each specimen into the right chemical to ensure they stay in their best possible condition. This process is crucial for long term maintenance of the museum’s entire marine collection. A day at work for me consists of making sure the natural sciences collection items stay in good condition. Working behind the scenes, within the collections allows me to help many students and scientists who wish to gain access to information stored in our database or to the specimens. I am currently working closely with our exhibition team because in June this year we will be opening a new amazing marine exhibition Moana – My Ocean!